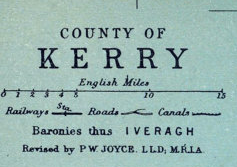 Trace your County Kerry or Irish Ancestors for free. If you would like to conduct your own family history research, we provide a full database of online genealogical records to help you on your way. Flexible, professional and cost effective full County Kerry genealogy search. You may just want a Birth/Marriage Death Certificate to add to your family records or even proof that you are eligible to hold an Irish Passport. Or you may want to find out who your ancestors were, what part of Kerry were they from and what they did for a living. How many children did they have? Were they in the military, were they ‘strong farmers’ , or were they humble agricultural cottiers? If tenants, who were their Landlords? The story is there, waiting to be told. We would like you to email us initially with basic information and tell us what it is you are trying to learn about your family. This initial enquiry is absolutely FREE. When we get this from you, we will assess the extent of your requirements, how long it will take and the approximate cost. We should be back to you within 48 hours with a few questions for more information. We will discuss by email the possibilities of proceeding, how long it should take, the options regarding costs and the possibilities of success. We will provide a quote, without cost or obligation. We can follow a direct line back from one ancestor of your choice (e.g. your paternal grandfather), following the surname back thourgh the generations to around 1800 (depending when Baptismal records were kept in individual parishes). This will usually cover 3-4 generations. We can of course offer variations on this option – search for two lines for instance, both your Paternal and Maternal lines or find whatever it is you are looking for, including photos, maps, certificates etc. Kay Caball is a qualified Genealogist certified by University of Limerick. We can provide you with a full tracing of your family backed up with relevant Certificates and Records. We don’t just find your Ancestors, we will also supply you with details of family life in the time and place he/she lived in. You will get to understand the motivations and actions of your ancestral family, the conditions they lived in, where they lived and why they left.